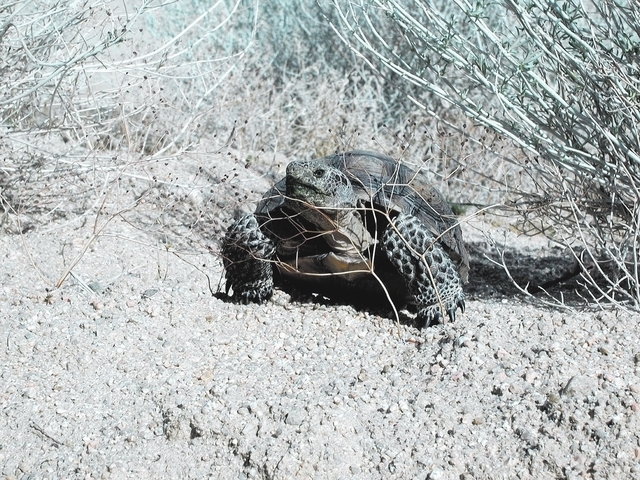 Nye County commissioners held a conference call Wednesday morning, approving four desert tortoise mitigation zones as part of a habitat conservation plan for the endangered animal. 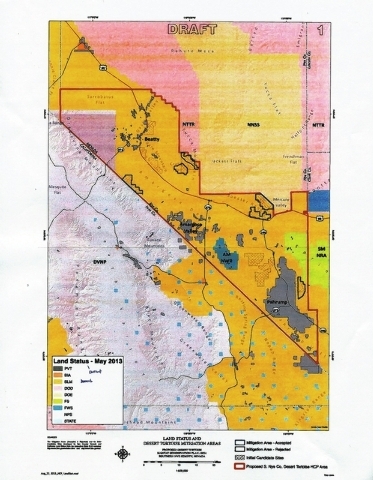 The four zones would be incorporated into a new resource management plan by the U.S. Bureau of Land Management Pahrump Field Office; the draft is due to be released soon. Nye County has discussed a desert tortoise habitat conservation plan for more than 10 years but one has never been approved. Previous plans suggested areas of high impacts to the tortoise, low impacts and no impacts with per-acre mitigation fees set accordingly. Developer Tim Hafen questioned where the four areas would be, known as Specter Range North, Specter Range South, North Amargosa Desert and Pahrump Valley East. Nye County Acting Natural Resources Manager Levi Kryder said the Pahrump Valley East Zone would be dissected by the eastern end of Simkins Road, east of the town boundaries but west of the Clark County line. Another area is north of Pahrump Junction at the intersection of Highway 95 and Highway 160 bordering the Nevada National Security Site. Another site is southeast of Beatty bordering the Nellis Air Force Training and Test Range; still another site is along the California state line south of Beatty. Hafen, who has been an outspoken participant during previous attempts to draft a county habitat conservation plan for the desert tortoise, said he’s now opposed to a plan and supports a request by Clark County to de-list the tortoise from the endangered species list. Hafen pointed to the release of desert tortoises in Trout Canyon last summer and added during previous meetings with former U.S. Fish and Wildlife Service state director Bob Williams he suggested the best way to deal with desert tortoises was to take them out of harm’s way and put them in an area where they can survive. Nye County Nuclear Waste Repository Project Officer Director Darrell Lacy assured Hafen the proposed Pahrump Valley East location is totally outside of private land that’s been developed with streets, but is on land managed by the BLM. But Lacy said the details are still being worked out. Lacy said the county received a letter from the BLM just last week, which set a Feb. 7 deadline to include the mitigation areas in the resource management plan. The county doesn’t have the resources now to prepare a habitat conservation plan for the desert tortoise, he said. “We did sign on to a letter saying we will not spend any tax money on tortoises,” Commissioner Frank Carbone said.